For the past decade, the Wyoming Department of Education has led the initiative to integrate career and academic learning across the state, adopting the occupational career clusters approved by the U.S. Department of Education. As part of the effort, vocational training programs and counseling are offered at 23 workforce centers throughout the state. In addition, public and private vocational and trade schools in most of Wyoming’s major cities offer postsecondary career and technical education (CTE) programs. Read on for specifics about programs currently available, as well as information about the fastest-growing vocational careers. 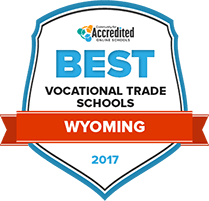 Look no further than the following rankings for an outline of the vocational and trade school options available in Wyoming. Through community colleges, career colleges and vocational and trade schools, students can find programs that prepare them to work in Wyoming's high-growth industries, including logging and wood processing. Our rankings make the search easier by taking into account factors such as program quality, tuition, length of study and financial aid options. Western Wyoming Community College, or WWCC, offers several certificate and 2-year degree programs to prepare students for the workforce. Prospective students can pursue an associate degree in a variety of fields such as business, education, math and science, technology, and visual and performing arts. Many programs are also offered online for those in need of more flexibility. Students who are uncertain about the specific career they want to enter can take general education courses and/or speak with a career counselor for guidance. About 64 credits are required to graduate from any of the college's 2-year degree programs. The school waives its admissions fee for applicants living in the United States. Upon request, campus tours are given Monday through Friday. Looking to earn the skills and training necessary for today’s competitive workforce? Casper College offers individual courses, continuing education, and certificate and degree programs to prepare students for the work world. Through its five departments, programs are offered in a wide range of disciplines such as accounting, art, business administration, computer science, entrepreneurship and radiography, to name a few. The college also has an honors program that offers advanced coursework, with a focus on leadership and social consciousness. Students come from all Wyoming counties, as well as 36 other states and 14 countries. In addition to its quality education, Casper College also has numerous extracurricular activities and opportunities such as clubs, sports leagues and service-learning trips. Students interested in studying a hands-on curriculum that may result in employment opportunities after graduation may consider enrolling in one of Eastern Wyoming College’s vocational programs. Students can pursue associate and certificate programs in various areas of study including welding, cosmetology, veterinary technology and accounting. To help make the transition from academics to employment smoother, EWC’s Career Services department can assist students with their resumes, interview preparation and find a list of available positions with potential employers. Students can also receive academic tutoring Monday through Friday at the school’s Center for Tutoring and Learning. Wyoming postsecondary technical skill attainment exceeded the state’s objectives by 5 percent in 2014, for a performance grade of about 73 percent. More than 4,000 Wyoming high school students, and more than 5,000 postsecondary students, are concentrating their studies in vocational education. With more than 2,500 students, health science was by far the career cluster with the highest enrollment in the 2013-2014 academic year. 96 percent of CTE high school graduates in Wyoming went on to employment or college, while 84 percent of postsecondary CTE grads pursued careers or additional training. One-year certificates and associate degrees are the most popular educational options for postsecondary students in Wyoming, with these levels of education standing at almost twice the national average. Employment opportunities for these graduates are more limited, however, with 7 percent of new hires in Wyoming going to applicants with some postsecondary education, and only 2 percent to those with an associate degree. These candidates did command higher wages overall, though, averaging about $5 per hour more than for those with no postsecondary training. At slightly under 600,000 people, Wyoming is the nation’s least populous state, but it does have several large employers in government (including the military), mining, education and healthcare. The top ten, in terms of total employees, are F. E. Warren Air Force Base (Cheyenne), the University of Wyoming (Laramie), Natrona County School District (Casper), Cheyenne Regional Medical Center, the U.S. Air National Guard (Cheyenne), Wyoming Medical Center (Casper), VA Medical Center (Cheyenne), Jackson Lake Lodge (Moran), and the Powder River and North Antelope coal mines in Wright, both operated by Peabody Energy. As Wyoming’s largest city and state capital, Cheyenne hosts a state workforce center and is home to a number of public and private schools that offer vocational certificates. At the secondary level, the Laramie County School District provides CTE programs in agricultural science, business, marketing, industrial technology, and healthcare. Two of the largest postsecondary schools offering vocational programs are Laramie County Community College (LCCC) and the Cheyenne campus of the Institute of Business and Medical Careers (IBMC). Founded in 1968, LCCC is a public two-year institution offering a wide range of both associate degrees and certificate options. Some 25 distinct programs can be completed at the certificate level, in areas including automotive technology, HVAC repair, computer support, engineering technology, web design, welding, homeland security and industrial maintenance. IBMC offers career training in business, healthcare, cosmetology, computer technology, and massage. Specific diploma fields include medical assisting, paralegal studies, and expanded duty dental assisting. Representing Wyoming’s educators, administrators and counselors in the field of CTE, the organization works in conjunction with a coalition of businesses to align career preparation programs with industry needs and technical trends. Online job search database that connects job seekers to employers in Wyoming. Also offers career training services, resume creation assistance and information about the Wyoming workforce and labor market. Visitors to the site can research CTE programs, training news, technical student organizations and available grants. The state’s comprehensive employment website includes job openings and training listings, information on labor standards, career planning tests, skills evaluations, and job search tools. More than 30 high school chapters make up Wyoming FBLA, with members participating in state, regional and community leadership conferences and student service events. This nonprofit, career and technical student organization advocates for the development of personal skills in family and consumer sciences education for students through 12th grade.